For North Babylon, N.Y., resident, Mike Ewanitsko, the Thompson World Series NASCAR Whelen Modified Tour race provided anything but a story book ending. Ewanitsko, who was forced out of NASCAR Modified competition over two seasons ago, burst back on to the scene this year after finishing fourth at New Hampshire International Speedway in September. Since then, his ride has had plenty of twists, turns and bumps. 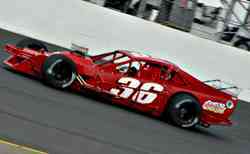 "Having Mike back is great," stated six-time NASCAR Modified champion, Mike Stefanik. "It is tough out there right now. For a long time, there was a group of guys who you were just used to racing with and Mike was a part of that group. It's great to have him back, because when you race around him, you know what to expect and you know that he's going to run you clean and hard. Chances are he'll be running you for a top spot, maybe the win." At Thompson this past weekend, Ewanitsko qualified 19th, but only made three circuits before getting involved in a serious looking incident. Afterward, Ewanitsko was physically okay, but pretty upset. "I don't know what that was all about," Ewanitsko said. "Carl Pasteryak just bounced us off the wall at the starter’s stand. It was pretty uncalled for. Once Carl got into us, we were just along for the ride. The car took a couple of pretty good shots. I'm okay, I'm just really disappointed for everyone involved with this." "When we didn't qualify for the Fall Final at Stafford, that was very frustrating," said Ewanitsko. "We were fast enough to make the race, but I didn't drive the car hard enough in time trials. In my mind, that is just regaining the edge I need to be competitive again. Qualifying is just being sharp and doing it over and over. It's been a while since I've had to be in that time trial mode." In September at New Hampshire International Speedway, Ewanitsko started at the tail end of the field. Because time trials were rained out, he didn't have to qualify and was able to work his way to the front. At places like Thompson, where passing has become a premium, the importance of qualifying is amplified and it is something Ewanitsko will continue to work on. "I've won pole awards before and have qualified up front," he continued. "It is just going to take getting comfortable again." The most comfortable place for Ewanitsko has always been behind the wheel of a NASCAR Modified. 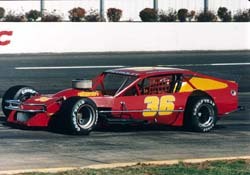 Since his youthful start at Riverhead Raceway the Long Island resident has always possessed the talent necessary to run with any of the talent that has come, gone and stayed in the division. Fortunately for Ewanitsko, Sunday's run at Thompson was just another small bump on Ewanitsko's comeback road. "We knew it wasn't going to be easy. We just have to stick together and keep working. We'll get there. We're in this for the long haul." After two corrective eye surgeries this Summer, Ewanitsko is looking down the road, literally, with a much clearer vision right now. "It is definitely different at the track," somberly stated Ewanitsko. "I miss Tommy. He helped us out so much. Even though he was always a little brash, he was the leader of our Long Island gang. I miss having him around. Between my Father Lou and Tommy, there was always someone around to straighten me out." For now, Ewanitsko is just happy to be back in the game that he loves. 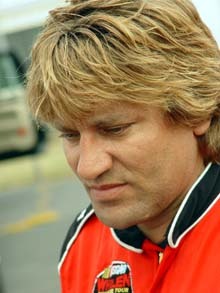 When the trees start to bud in the Spring of 2006, the long-haired driver, who resembles Jon Bon Jovi, more than he'll admit, will be back doing what he loves to do. This year isn't the first time that Ewanitsko has raced the #36. This Howie Hodge photo is from Martinsville in 1990. Mike Ewanitsko at New Hampshire this year. don't require glasses anymore. It's phenomenal," offered Ewanitsko. "We've got a good crew chief in Brad LaFontaine and with Eddy Whelen as my car owner, I can focus on getting back to the level I was at before I had to walk away,"
Ewanitsko looked into the distance and continued. "I was miserable. I missed racing. I didn't come to the track. I didn't want to be around it, now, I can't wait to work on the car and get to the track. It hasn't always been that way and I can see it from both sides now. It really makes a difference if you are excited to be here." Ewanitsko is now carrying the legacy of the Long Island gang. He is the final link in the crew of racers that followed in Tom Baldwin's footsteps.